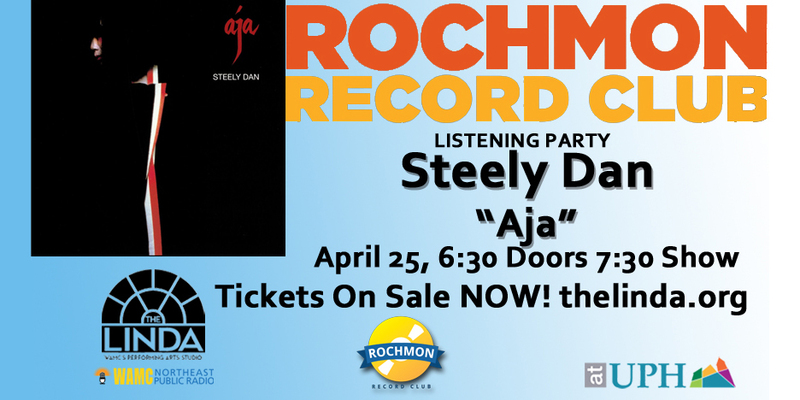 On Thursday April 25 at 6:30 The Rochmon Record Club will converge to listen, learn about and discuss the classic 1977 album “Aja” by Steely Dan at The Linda, WAMC’s Performing Arts Studio. “Aja” Steely Dan’s 7th and best-selling album is considered by many audiophiles to be a masterpiece of production perfection. Featuring songs such as “Black Cow”, “Aja”, “Deacon Blues” and “Peg” the album is a wonderful hybrid of the rock and jazz worlds, a very specific sound to Steely Dan that makes all their music instantly recognizable. We will listen to the album on The Linda’s state of the art sound system. The Listening Party begins at 7:30 pm with a live audio & video presentation by Chuck Vosganian aka “Rochmon”. A Rochmon Record Club Listening Party is meant to inform and deepen our understanding of the history of the individual performers, the songs and the stories that made this iconic album. By listening together we get to hear the album again for the first time. The Linda’s kitchen will be open for light food and drinks. The Rochmon Record Club is presented by Universal Preservation Hall. The Rochmon Record Club is held on the 3rd Tuesday of the month at Caffe’ Lena (caffelena.org) in Saratoga Springs and the last Thursday of the month at The Linda (thelinda.org) in Albany, programming varies by location, please check websites for tickets and show information or go to Rochmon.com for more information.